Topics: Gift Certificates, and Custom Corner. 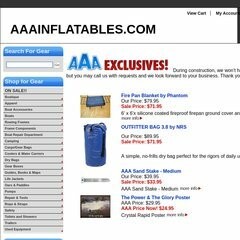 aaainflatables.com AAA Inflatables - Rafts, Catarafts and Inflatable Kayaks by Avon ..
aaainflatables.com AAA Inflatables - Gear Boxes - AAA Inflatable Repair, Inc - The .. The estimated 14 daily visitors, each view 5.00 pages on average. The site is programmed for ASP.NET. It has 2 DNS records, ns4.volusion.com, and ns3.volusion.com. It is hosted by Volusion California, using Microsoft-IIS/6 web server.